True Crime Classic "In Broad Daylight"
book In Broad Daylight detailed the murder of a town bully as scores of people looked on, 18 years since the book hit The New York Times bestseller list, ultimately selling more than 2 million copies. Two good reasons: It’s a gripping story, painstakingly detailed by MacLean. And the new edition, just out from St. Martin’s to mark the 25th anniversary of the killing, offers an epilogue from the author that comes as close to solving the crime as anyone may ever come. The new edition of the Edgar-winning title is out to the tune of 100,000 copies. Get your hands on one of them for a page-turning read. New York Times bestseller Edgar Award winner In Broad Daylight and The Story Behind In Broad Daylight are now available as audio and ebooks. 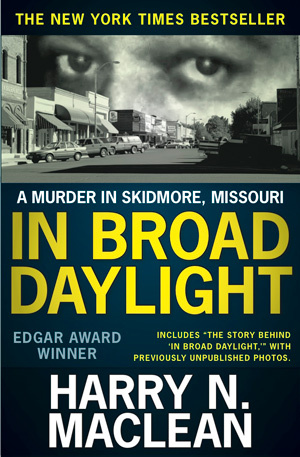 In Broad Daylight is also available in a new classic print edition, which includes a complete update from the author with new information on the killing, the investigation, and photos of the presumed killer. ALSO includes “The Story Behind In Broad Daylight”. The book was made into a movie of the same name in 1990, in which Brian Denehey played Ken McElroy, Marcia Gay Harden played his wife, Chris Cooper played the trooper who stood up to McElroy, and Cloris Leachman played the grocer’s wife. 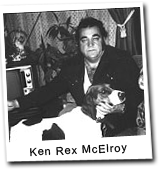 Ken Rex McElroy was an illiterate hog farmer who lived on the outskirts of a small town in Northwest Missouri. For over twenty years he raped, robbed and burned almost at will. Cops were scared to arrest him, prosecutors were scared to prosecute him, judges were scared to judge him, and juries were scared to convict him. Over the years, Skidmore and many other small communities became convinced that the law was incapable of protecting them from McElroy. They watched in awe as he walked away from one crime after another. Finally, in July 1981, Skidmore had enough. A year earlier, McElroy had shot an elderly grocer in the neck after an employee in the store had allegedly accused one of his daughters of stealing candy. Highway Patrolman Richard Stratton arrested McElroy on the back roads of Northwest Missouri and brought him in. The grocer survived and testified at McElroy’s trial. To everyone’s surprise, McElroy was convicted of assault. Instead of jailing him, however, the judge turned McElroy back into the community. Angry, paranoid, McElroy pulled guns and threatened to kill the old man and others. Four men swore in an affidavit to what he had done, and prepared to testify at a hearing to revoke McElroy’s bond. Men in the town gathered to protect them on the day of the hearing. On hearing that the judge had once again continued the hearing, they met to decide what to do. McElroy, hearing of the meeting, drove into town with his wife, Trena. After a brief confrontation in the tavern, the two went outside to his truck. He was sitting in the Silverado, with Trena beside him, when two men across the street opened up with rifles and shot him to death. Ken Rex McElroy sat in his truck for over an hour before the law was called. Over the next two years, three grand juries were empaneled and testimony taken. The witnesses all claimed they had seen nothing. No one has been indicted for the murder of McElroy. One of the killers has died. 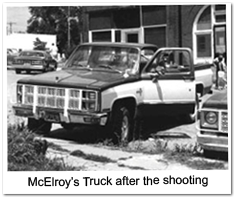 In Broad Daylight tells the story of McElroy’s reign of terror, his shooting, and the cover up of the identity of the killers. The e-book version brings the story up to date as of the 25th anniversary of the killing.The Classic Print edition contains “The Story Behind In Broad Daylight,” which tells how the Denver lawyer came to investigate the crime and write the book. It tells of his trials and tribulations, including having a gun pulled on him, being bit by a dog, and having his tires slashed. It describes how he was finally accepted into the home of a highly-respected local farm family. The book answers many questions about the killing itself, such as who was involved and what has become of them. The book explores the nature of the moral consequences of the killing for the town and those involved in the killing.